On the 1st time is spent reflecting on the change in condition, where this time last year the Battalion saw in the New Year in support of the front line, near Loos. The Officers of the Battalion are treated to a magnificent dinner "by a grand old gentleman of Dutch extraction, Baron von Oldenoel, in his châteaux". The Battalion marches on to Lierde St. Martin (20km east). On the 2nd the march is continued to Renaix [now Ronse] (20km south-west), which had previously been used as a training ground area for German divisions on rest, and as such the demeanour of the people is not so disposed towards the further "invaders". It is noted, however, that they have mastered the art of producing claims against their visitors. On to Herinnes[-lez-Pecq] on the 3rd (10km south-west), where they reach the enemy line held prior to the action at Valenciennes. On the 4th they reach Dottignies (4km north-west) as do their long lost blankets (which had not been seen since Dec 29th, 1918). Dottignies is a modern industrial village in an area of factories, but whose population had been greatly depleted at the on-set of war due to men of military age being sent away to work in Germany. The remainder of the month is spent at Dottignies, with the time occupied by parades, dances, football (soccer) games, one of which on the 12th saw the local team field a goalkeeper who wore a stiff hat and smoked throughout the game! The Battalion won 1-0, but it was noted that "The Belgians know the game, however." Cinema and baths, delousing, medical and kit inspections, boxing and wrestling, and indoor and outdoor baseball also occupied the Battalion's time. Of note was a visit by General Sir Arthur Currie on the 17th, bringing news that the 3rd Division (which included the Battalion) would be going home first. Education and lectures continued with subjects such as "Democracy and its part in the future peace of the World." The Band held a well attended concert on the 31st, as it readied for Yonge Street and Queen's Park [a Toronto home-coming]. The beginning of a new month sees impatience building as the Battalion remains in Dottignies. Training continued and on the 5th excitement was stirred up when 80 five day leave passes were issued. The day also saw the Battalion Boxing and Wrestling tournament, with Pte. Frank McCarthy "showed real class." A pair in the wrestling competition were locked in "one very fine hugging match" for 30 minutes before the crowd requested "Demoblize 'em" and the match was declared a draw. The 6th finally saw orders to move on and the Battalion, with great pleasure, marched on to known entraining area, Blandain (10km south). 300 leaves were granted, and the whole party left by train on the 7th. Scattered billets were also relocated into town that day. On the 9th the Battalion moved on to Basieux (20km south), where it unlimbered the horses, which were taken to Renaix for turning in. At 19;30, after some delay, the Battalion is under-way by train, with comforts such as blankets, stoves, fuel and rations in each rail car. The train stopped for the night at 21:00 and did not moved on again until noon of the 11th. A stop and start day saw 60km covered in the first 24 hours. During one stop, a Captain left the train some distance, and found it gone when he got back. Knowing it would stop and start, he walked 15km, got a lift on a lorry and caught the train up at a sleep stop in a siding. A covering of snow blanketed the countryside and much to the disappointment of the men, the old front line was passed through during the night. The port town of Le Havre is reached at 20:30 on the 11th, and the Battalion marches into freshly built rest camp huts. The men are served supper and preparations are made to ready documents for the coming travels. The 12th is spent in baths, getting fresh underwear and getting deloused. Many of the men also get opportunity to visit Le Havre. The 13th sees the Battalion boarded and en-route for England at midnight under a weak moon, clear weather conditions and on a smooth, safe sea. It is now that many realise that the war is over, that many of their friends are lying in the fields in France, and they themselves will not be returning to war. "For the first time we realized that we were actually severing all connection with the war and that from this point forward we would be living on our memories alone." Reaching Weymouth at 09:30 on the 14th, the Battalion disembarked almost immediately, went directly to the station and moved off straight away on a train with the novelty of stuffing in its seats and glass in its windows. By dark they had travelled the 150km or so to Liphook, in Hampshire. Marching off to a Camp Borden tune, the Battalion reaches billets in nearby Bramshott. On the 15th the word "Documentation" is noted as entering the vocabulary at this time, with copious amounts being bestowed on the Battalion in preparation for the homeward travel. In the following days, when training is "nil", paperwork is overwhelming and a drought is on, time is spent exploring the locality, undertaking sports, and getting involved in the increasing craze for dancing. Whilst education and sports resume, a call for dancing instructors is made to assist the men's' indulgence to "tickle-toe" and "jazz". The craze is reported to have ensnared even the Generals. On the 20th influenza again raises its ugly head, with cases appearing in the last several days. In a bid to halt its spread, gatherings of any kind are stopped. The remaining days of the month are spent in dealing with documentation, medical, dental and pay parades and route marches resume when the recently inclement weather abates. It is noted on the 27th and 28th that documents for the men amount to 15 to 27 per man, and have to be inspected by representatives of the Militia Department of Ottawa before they are allowed to leave for home. On the 1st, 8 officers and 10 other ranks pulled an all-nighter to speed up the preparation of their documentation, and begin work on 55 copies of the Nominal Roll. By the 3rd, the documentation night-shifts had become a regular fixture. On the 4th, with sights set on departing on the 6th, the Battalion is informed that they will most likely now depart on the 8th. As they wish to leave for home with as many of the Battalion as possible, a few extra days to locate the missing paperwork is received better than anticipated. Amidst appalling conditions on the 7th, the Presentation of the Colors was made, with General Draper presiding. The King's Colors were presented to Lt. James Alexander McLauchlan and the Battalion Colors to Lt. Dryke [name not known, but more probably Lt. Albert Edward Dyke]. Forming up at 01:30 on the 8th, the Battalion proceeds to the rail station and departs for Liverpool in two trains, an hour apart. A stop is made at Crew where free tea was served, and they reach Liverpool at 14:25 on the 8th. The Lord Mayor of Liverpool, John Ritchie, addressed the Battalion	and wished it "Bon voyage." Boarding the S.S. Carmania at 18:00, the men were fed by 20:00. 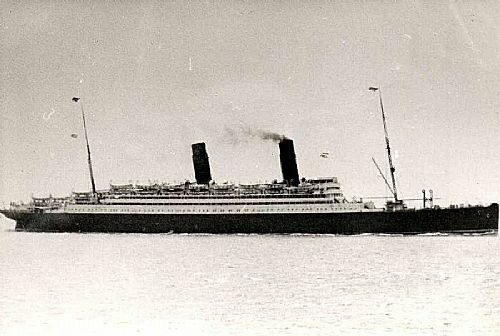 At 02:00 the S.S. Carmania weighed anchor and thus began the 9 day voyage back to Halifax. Canadian soil was sighted on the 17th and although the ship finally docked at 08:30, the Battalion could not disembark until 14:00. Each man received $5 pay for train incidentals as they boarded two trains bound for Toronto via Montreal. 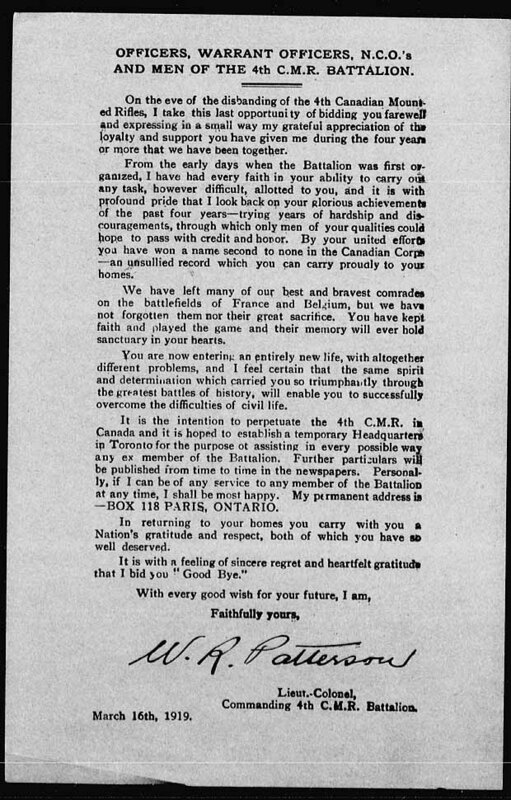 Colonel Patterson's letter of appreciation was distributed on the train. Arriving into North Toronto at 20:00 on the 20th, a mass of humanity had turned out to see its own home in style (please see the Toronto Daily Star article link below). The route to the Armouries was packed. In front of the Parliament Buildings Brigadier-General J. Gunn, Commanding Military District No.2, took the salute and the Battalion's last "eyes left". With difficulty the Battalion squeezed into the Armouries, as along the way it had picked up mothers, wives and sweethearts [and presumably children, fathers, brothers, sisters, and family members and friends of all types], but all were allowed entry. Whilst speeches had been planned, it was late, and the only speech necessary at 23:00 was the one concerning where and when to report for demobilization. "Then for the last time the O.C. [Lt.-Col. Patterson], with a lump in his throat and a pang in his heart for the men he learned to love and many of whom he would never see again, gave the command "4th C.M.R. Dismiss." "Three cheers for Col. Patterson" brought forth such an outburst of enthusiasm that the whole building shook." Those that wished to demobilize that night could do so, and in fact 302 took the opportunity before 01:30 on the 21st. The remainder, required to report by 08:00, were demobilized by 10:00 on the 21st. "Canada has truly welcomed home the 4th C.M.R." A colourful and enlightening account of the 4th CMR's home-coming was recorded in this Toronto Daily Star article of March 20th, 1919. Entitled, "CROWD OF 250,000 WELCOMED WARRIORS" the detailed events continue under the sub-banner of, "Interesting Incidents of the Night - How Toronto Greeted the 4th C.M.R." Please note that the article image is produced by and reproduced here with permission of ProQuest LLC as part of ProQuest® Historical Newspapers. www.proquest.com. Further reproduction is prohibited without permission. Many thanks are extended to ProQuest for permission to use the article here. Please do abide by the above article reproduction restriction.